Quizzle Review - What Sizzles? What Fizzles? Quizzle is a service that offers you a free credit score and report. To use the service you don’t need to provide a credit card number and they provide all kinds of great tools to help you improve your credit score. Sounds perfect, right? It’s not. I will tell right up front that Quizzle has a great value proposition and I like these folks. But there are some drawbacks. And the main benefits of using Quizzle are not those which are advertised. There really are hidden gems for Quizzle users that add value unlike any other credit score service. What follows is a deep dive into the world of Quizzle; what they promise and what they deliver. First let’s take a look around. As we do, I’ll point out where Quizzle sizzles and where it fizzles. OK Shazzizle? And what you see above is just the tip of the iceberg. They asked about my residence, the equity in my home, my income and net worth. They also wanted my Social Security Number. I wasn’t crazy about providing all that information but I realized that the credit scoring companies have to know something about me (and you) in order to generate their scores. To make it easier to cough up your data, Quizzle promises that their site is secure. They also state that when they run your score and report, it’s a “soft pull” and therefore not detrimental to your score. I suppose we have to take them at their word on that one. Quizzle, like Credit Sesame, uses Social Security numbers to get your credit information. The other credit scoring companies use your credit card number to get the skinny on your credit history. No matter who you work with, you can’t get your credit score without providing one of those two numbers to somebody. Sorry Charlie. How Can Quizzle Do This For Free? Quizzle will actually provide your credit score and an Equifax credit report for free with no strings attached. And you can get a free report twice a year at no cost too. Snazzy. But they monetize their site by pitching you products based on how you answer the questions on the opening page. For example, if you enter information about your mortgage, they might try to “help” you refinance with a more attractive loan down the line. After all, Quizzle is owned by Quicken Loans. If you have a credit balance on a card and are paying a high rate, they can pitch a lower-interest card. Once they have your email and your info, they know what you might be interested in and when. This doesn’t bother me. If they can offer a financial product that is going to help me save money, what’s wrong with that? Free Credit Score – So What? As I said, they’ll l run your score for you for free once you input your information. But the credit score isn’t as helpful as you might expect. That’s because they run a VantageScore ® report rather than a FICO score. The problem is that most lenders use the FICO score when they decide to extend credit to you or not. The VantageScore hasn’t got much juice. In fairness to Quizzle, I must tell you that very few Quizzle competitors offer FICO scores so this flaw isn’t specific to this firm. But keep in mind that VantageScore and FICO are really two very different animals. The VantageScore is usually lower than the FICO and they really don’t correspond. That’s because the VantageScore uses different criteria and assigns different weightings to your financial picture. In other words, your VantageScore ® might give you a general idea about your FICO score but it certainly won’t correspond directly. The image below gives you an idea as to how Quizzle via VantageScore determines your credit score. By far, the first three items (payment history, age and type of credit, and percentage of available credit used) are more important than the following three. This is helpful because FICO puts a greater weight on those items as well. That means if you use the free tools available through Quizzle to improve the components of a good credit score, it will lift your FICO score as well. More on those powerful tools shortly. 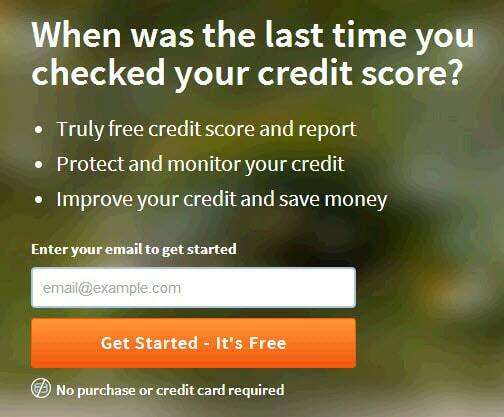 Once you sign up for the free Quizzle credit score, they provide a full Equifax credit report. While the credit score has limited value, the accompanying credit report is fantastic. The other credit scoring companies provide credit reports too but they are only partial reports. This report really is a magnificent tool. When you review your credit report you can easily identify any mistakes and correct them. That can be the difference between night and day and add crucial points to your score. The credit report is comprehensive and easy to understand. It covers everything from mortgages, credit cards, auto loans, student loans, unpaid medical bills and other history that might need your attention. I love the credit builder tools that Quizzle offers. Included in the free package are tools to help you really get your credit world together. Credit Comparison – Have you ever wondered why your credit score changed? Wonder no more. Quizzle users get a detailed report highlighting exactly what has changed between any two credit reports and how that may have influenced your score. The benefit is that you won’t have to shift through your old reports line by line searching for that needle in the haystack. Quizzle does all the work for you. Thank you Quiz! Credit Timeline – This report shows your credit history in chronological order from age 0. I’m not kidding. I interviewed the Director of Client Relations Katie Bushor for this post and she explained that the timeline goes back to the day you were born and shows every chapter of your credit history. This is a great way to get a handle on the crucial events that formed the credit story that is yours today. Besides highlighting key events this tool also offers up some educational ideas to help you push your score higher. Credit Trending – This tool shows the general direction of your credit score over the years. Better yet, it shows your available credit and utilization over the years too. Last, this trending tool points out key points that may have had a heavy impact on your score. Score Analysis – What keeps you from having a perfect credit score? Use this tool and find out. Of all the benefits of using Quizzle, this is the one I value most. This report gives you practical ideas on what you need to do in order to have the highest score possible. This is like having your very own credit score advisor/coach – for no cost. Quizzle is a free service you should take advantage of if you want to improve your credit score. Unlike any other service I’ve investigated, once you sign up for Quizzle, they show you what going on and (more important) shows you exactly what you need to do in order to improve your numbers. I love the free credit score improvement tools and the free Equifax credit report. I’m not a fan of the VantageScore because I’d prefer FICO. But as I said, none of the free credit score companies offer FICO scores so I don’t consider this a major drawback. As I said, I spoke to Katie Bushor the Director of Client Relations and she was a straight shooter. She was direct and really knew her stuff. This gave me a lot of confidence in Quizzle. I think this is a service worth checking out if you want to find out what your credit score is and are ready to get to work improving it.